Free Community Spaghetti Supper in the Parish Hall, Wednesday, November 11, 5:00-6:30 p.m. Spaghetti with meat and veggie sauces, salads, garlic bread, beverages and desserts. Donations will be welcome for St. Saviour’s outreach programs. Handicap accessible. Public Welcome! Ecumenical Healing Service: Thursday, November 19, 6:00 p.m., Parish Hall, Guest Speaker will be The Rev. William “Beau” Wagner. All are welcome. BAR HARBOR COMMUNITY RALLIES TO HELP SYRIAN REFUGEES. Area religious and civic organizations, libraries, and citizens will hold an event on Saturday, November 7 from 3 to 5 p.m. at Bar Harbor Congregational Church to help educate residents about the tragedy affecting the Syrian people and what can be done about it. The program will also feature local musicians, a singalong, and puppets for children. Speakers will feature Tarlan Ahmidov from Catholic Charities in Portland that is the U.S. State Department's designated organization in Maine to resettle Syrian and other refugees. Also College of the Atlantic student, Moni Ayoub, from Lebanon, who has worked in a Syrian refugee camp, Heath Cabot on the COA faculty who will comment on the Syrian refugees flooding into Europe, and a COA student who will speak on drought and climate change as one of the drivers of the Syrian refugee crisis. Information will be provided about organizations dealing with the crisis and contributions to one or more of them will be encouraged. COFFEE’S ON! The Maine Sea Coast Mission cordially invites all MDI Senior Citizens to join them for Coffee, Conversation and Music every first and third Tuesday of the months during the winter. The first get togethers are Tuesday, November 3 and 17 from 9:30 to 11:30 am at the Colket Center, 127 West Street, Bar Harbor. Music will be provided by Ruth Grierson! Come, brings senior friends and neighbors and join the fun! At Home Mount Desert Island, a program of Washington Hancock Community Agency, is a member-based, volunteer supported program designed to provide older residents of Mount Desert Island with core services, empowering them to continue to live independently in their homes for as long as they are able. Contact Program Manager, Kara Janes at 374-5852 or kjanes@whcacap.org about volunteering. Keep in your prayers this week: Gloria Magruder, Michael Shook, Catherine English McCann, Patrick Foote, Heather Frazier, Jamie Li, Malcolm Hughes, Adam Harkins, Nancy Kincaid, Trevor Agar, Herb Hasenbalg, Jack Weisner, John Cronin, Sarah Flynn, Trisha Roy, Bob Theriault, Ron Martin, Joseph and Kimberly Pratt family, Lydia Thayer, George Swanson, Jennie Cline and Sharon Dayana Salazar, our sponsored child in Costa Rica. The Rt. Rev. Michael Bruce Curry, Bishop of the Episcopal Diocese of North Carolina, was elected and confirmed as the Presiding Bishop and Primate of The Episcopal Church at the 78th General Convention on June 27. According to the Canons of The Episcopal Church, he becomes Presiding Bishop on November 1. Bishop Curry is the first African-American to be elected Presiding Bishop of The Episcopal Church. Bishop Curry will be the 27th Presiding Bishop, the Primate, and the Chief Pastor of The Episcopal Church. He will also serve as President of the Domestic and Foreign Missionary Society. All are invited to join a Vigil Celebration and Eucharist, sponsored by the Union of Black Episcopalians (UBE) in honor of the 27th Presiding Bishop on Saturday, October 31 at 11 am Eastern at the Armory, 2001 E. Capital St. SE in Washington, DC. Presiding Bishop Katharine Jefferts Schori will preside at the Eucharist and Presiding Bishop-Elect Curry will celebrate. The Domestic and Foreign Missionary Society will sponsor a live webcast of the Vigil Celebration here. The Holy Eucharist with the Installation of the 27th Presiding Bishop and Primate of The Episcopal Church, Bishop Michael Bruce Curry, will occur on Sunday, November 1 at noon Eastern at Washington National Cathedral. The Holy Eucharist with the Installation of the 27th Presiding Bishop will be live webcast available here. Diocesan Convention – Tim+, Bunny Watts, Rita Redfield and Ted Fletcher will be representing St. Andrew and John Friday and Saturday at the 196th convention of the Diocese of Maine in Portland. We will report back on the action of convention this Sunday, but in the meantime keep us and all the Diocese in your prayers. 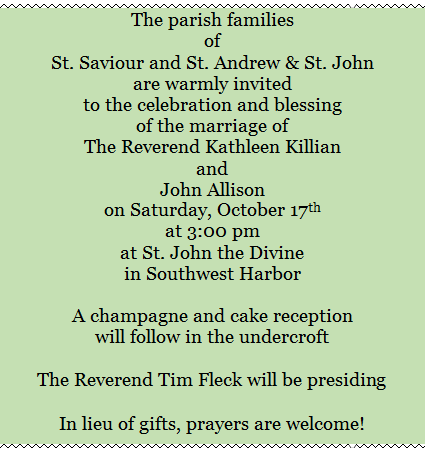 on Sunday, October 25, at St. John’s in Southwest Harbor! Dean Henry will be speaking at both services, with a festive coffee hour fellowship following the 10:00 am service. Proceeds from non-pledged donations on this day will go to the Westside Food Pantry. Please join us in marking the cooperative sharing of the Westside communities and St. Andrew and St. John Episcopal Church! “It always takes two to share—the giver and the receiver. Next Sunday – God willing, The Rt. Rev. Michael Bruce Curry will be installed as XXVII Presiding Bishop of the Episcopal Church at 12:00 noon at the National Cathedral, Washington, DC. The liturgy will be webcast live; we will show it in the undercroft at St. John’s, or you may watch at home at www.cathedral.org. Taizé - An Ecumenical Prayer Service, Friday, October 23, at 6 pm in the Chapel. Simple, yet profound. Experience the spirituality and the meditative songs of the Taizé community, an interdenominational and ecumenical monastic order known around the world for its message of trust, peace and reconciliation. The Waste Not, Want Not Thrift Shop is open Saturdays from 9 am - 12 pm, Wednesdays 3:30 pm - 6 pm. We are accepting, good clean clothing & linens. Think of us when you are cleaning out your closets. Leave donations in Church Parish Hall. Call for more information 288-3674. Begin the Conversation: Sundays, October 25 and November 1, 3:00-4:40 p.m., Seaport Village (adjacent to The Moore Center), 125 State Street, Ellsworth. Some things should not go unsaid, like your wishes for end-of-life care. Come break the silence with hospice volunteers Barbara Sinclair and Gerry Gregersen, who are offering a two-week class. Participants will explore views, attitudes, and fears about death and the dying process as well as learn how to talk with loved ones about end-of-life decisions. They will also consider medical advance directives, medical agents and tools to help honor individual values and beliefs. Pre-registration is required. Call Barbara at 664-2488. Coffee’s On – The senior coffeehouse at the Maine Sea Coast Mission is starting its season. Sessions will be the first and third Tuesday of each month from 9:30 to 11:30, beginning November 3rd. St. Andrew & St. John will be the designated hosts for the coffeehouse on January 5th, but all are encouraged to come any time to share fellowship, music, and snacks with our older neighbors. Transportation is available and coordinated by Island Connections. Keep in your prayers this week: Michael Shook, Catherine English McCann, Patrick Foote, Heather Frazier, Jamie Li, Malcolm Hughes, Adam Harkins, Nancy Kincaid, Trevor Agar, Herb Hasenbalg, Jack Weisner, John Cronin, Sarah Flynn, Trisha Roy, Bob Theriault, Ron Martin, Joseph and Kimberly Pratt family, Lydia Thayer, George Swanson, Jennie Cline and Sharon Dayana Salazar, our sponsored child in Costa Rica. 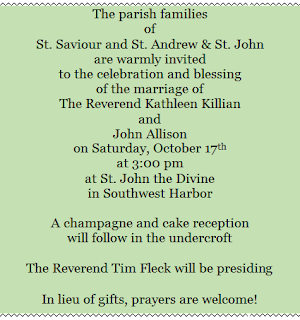 on Sunday, October 25 at St. John’s in Southwest Harbor! Piano Recital: Concert pianist and Wheaton College music professor Ann Sears will play a recital on the 1918 Steinway piano at the Salty Dog Gallery, today at 5:30 p.m. The recital will benefit the Westside Food Pantry. All donations will be appreciated. Coffee’s On Planning Meeting: One of the highlights of last winter was the warm and pleasant time we spent with Island seniors aged 60 to 90 at “Coffee’s On” every first and third Tuesday of the month at the Maine Sea Coast Mission. The Mission is happy to be able to offer this program once again from this upcoming November through April 2016. And I am pleased to report that Ruth Grierson will again be providing our toe-tapping background music. You are invited to a breakfast meeting at the Mission, 127 West St., Bar Harbor, on October 20th at 9 AM to plan for the upcoming season. Please call Terri Rodick at 288-5097 and let her know if you are coming to the meeting or if you have any suggestions.